I recently became interested in science communication (SciComm). Being a scientist, I’m learning to use science writing more effectively and also to visualize scientific concepts for laymen. For starters, I attempt to simplify figures in my research papers, and write about my research with visual aids for the general audience. Out of curiosity to know how professionals do it, I attended SciVizNYC this week, an annual event on science and data visualization. Here are some of the takeaways. The first keynote of the day was given by Kennedy Elliott, senior graphics editor at National Geographic. Her theme was “explain and connect”. To achieve that, she suggests we forget whatever we know about the topic we intend to discuss and start as a novice. We need to identify the topical literacy of our audience and use a suitable medium to convey the scientific message [read her piece on The Science of Hummingbirds here]. Graphic designers and science illustrators do this as their day jobs, but for scientists to make an attempt at visualizing data for the general audience, we can focus on these points: (1) give our story a human context, (2) choose the points that matter (not every detail of the study), (3) recreate reality, (4) use visual metaphors, and (5) tell a story. The Science of Hummingbirds [National Geographic]. By Kennedy Elliott and Monica Serrano. Video by Anand Varma. As a scientist, I’m keen on conveying the research in easy-to-understand ways, and the first place I start is in the figures I make for my paper. Some studies are picked up by the media which then highlights it with their own version of an infographic. “Not all infographics are made equal”, says Lucy Reading, graphics editor at Quanta magazine. When creating infographics, we need to advocate for our readers; look for key characters in the study and the main theme when making an infographic. As scientists, one instance we can make good use of a well-made infographic is in the table of contents graphic that journals ask for nowadays (an image that goes with the abstract of a paper). Our graphic should create enough interest in the reader to make them read the article. Her tips for a good infographic? Look for the “money shot” in a research article and use that in the infographic to convey the story, and leave out things that the readers will not know. 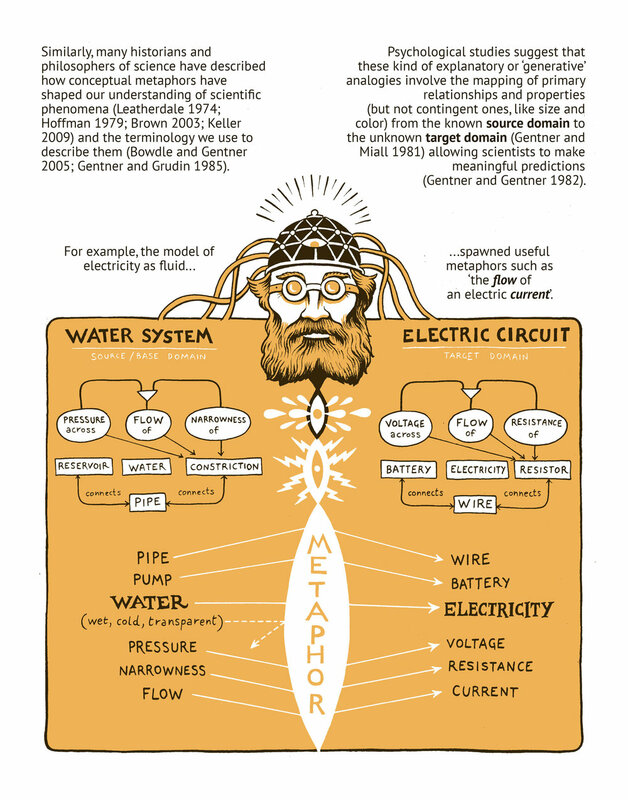 Reproduced from: M. Farinella, Of microscopes and metaphors: Visual analogy as a scientific tool. The Comics Grid: Journal of Comics Scholarship, 8: 18, 1-16 (2018). When it comes to research, most of the illustrations are done by scientists who are not trained illustrators. Tami Tolpa thinks this is an under-utilization of visual art to convey scientific concepts. By choosing actors and actions from main ideas of a scientific study, we can use pictures as portals, where pictures are explanatory as well as exploratory. Artists who delve into hands-on science use it as a tool to create a captivating and compelling stage for science topics. Tarah Rhoda from SVA Bio Art lab uses biotechnology tools to create art work (art using bacterial cultures, for example). Matteo Farinella, on the other hand, uses comics for communicating scientific topics. He believes that using metaphors for scientific concepts and using fictional characters to guide the reader through the concepts can be very effective. We look at well-crafted figures in science magazines or those wonderfully detailed renditions in top scientific journals. Matt Wimsatt’s images created from electron microscopy volume data of tissues and cells have adorned the cover pages of his institution’s bulletins. But science illustrations are more than just eye candy, claims Matt. We can use data visualization (3D rendition of electron microscopy data, for example) to understand scientific processes and explore biological phenomena. Similarly, Christian Stolte works on MetroNome, a web-based exploration platform for genomic medicine. Brian Foo, data visualization artist at the American Museum of Natural History says data are specimens that we collectively use to engage the audience. Science visualization is not new and has been around for centuries with authors creating artwork about scientific endeavors. Robin Naughton from The New York Academy of Medicine spoke about her efforts at digitizing rare materials that are not only science illustrations from our history but are also a cultural heritage. Digital collections let anyone access and explore these rare materials. While illustrating scientific concepts is one aspect of science visualization, artists have taken to different mediums to engage the general audience in science, or to give them the human context of a science story. Jennifer Jing from BioDigital, a human anatomy visualization platform, spoke on the difference in designing visual content for consumers and professionals. David Chuchuca takes to photography to show the human side of scientists and their relatability to people. He thinks there is limited engagement between the learned and the layman, and that it is important to “position scientists as approachable experts in a community”. Judith Modrak, a sculptor by training, then shared about her “Our memories” exhibit and how she used neuron-inspired sculptures to invoke audience participation for her exhibits. In her view, artists are conduits for the art (based on science) where scientists are the authors. My view of science visualization was limited to infographics and animations of scientific concepts. I realized it extends to the real world in understanding these concepts, and perhaps, to use them to benefit people. Christine Hendon uses a technique called optical coherence tomography to collect 2D images of heart tissues and reconstruct a 3D image. These images are used for radioablation, where radiofrequency waves are used to heat up tumors and destroy them. She aims to create a “cardiac atlas” based on her techniques that can aid in this image-guided therapy. Alfred Marc Iloreta, a surgeon at Mount Sinai, uses virtual reality (VR) and augmented reality (AR) to train his residents for surgeries. He also uses VR technology to understand the human body better, and to use it to minimize elaborate surgical procedures on patients. He says VR helps him to “see” anatomical features. He also believes that the technology helps doctors to educate the patient. As researchers, we have a role in educating the public about our science projects and results. We can only do that by simplifying concepts, using available tools to visualize our ideas, results, and imagination.